The global market for orthopedic braces and support, casting and splints features a high degree of fragmentation marked with a large number of global and local players, says Transparency Market Research (TMR) in a new report. In this competitive market, large players are collaborating with small manufacturers to offer offbeat products that will help them garner large market share, adds the report. Technological advances and pursuits to offer a varied product range are the two key growth strategies players in this market have resorted to. For example, in May 2015, BSN Medical GmbH introduced a gamut of new wound care products. Of them, three new products are based on the company’s proprietary dialkyl carbamoyl chloride (DACC) technology. Leading companies operating in the global orthopedic braces and support, casting, and splints market include Prime Medical, 3M Healthcare, DJO LLC, Zimmer Biomet Holdings Inc., Össur Hf, and Stryker Corporation. 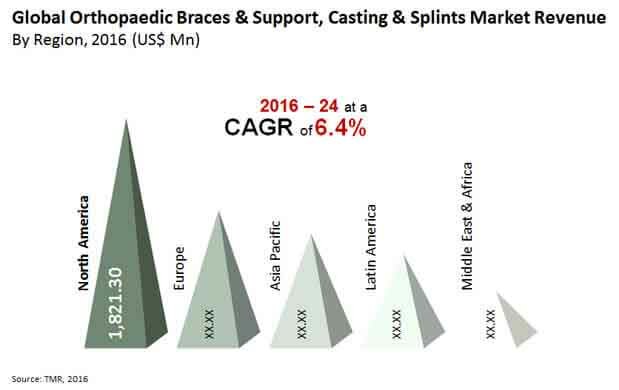 The global market for orthopedic braces and support, casting and splints market stood at a valuation of US$4.6 bn in 2015. Rising at a CAGR of 6.4% between 2016 and 2024, the market is anticipated to be worth US$7.9 bn by the end of 2024. By product, the segment of orthopedic braces and support is poised to lead the orthopedic braces and support, casting, and splints market with 58.4% share by 2024. Companies are making consistent efforts to use new materials and technologies to develop braces that serve patient’s requirement as closely as possible. This, in turn, will boost the orthopedic braces and support segment to display leading year-on-year growth over the report’s forecast period. In terms of distribution channel, the segment of orthopedic clinics held the leading 37.4% share of the overall market in 2016. Geography-wise, North America currently leads the global orthopedics braces and support, casting, and splints market and is predicted to remain at the fore through the forecast period. Across the world, increasing incidence of sports injuries is majorly fuelling the orthopedic braces, support, casting and splints market. This factor is majorly exhibiting demand for foot and ankle devices in the orthopedic category. As per the American Academy of Orthopedic Surgeons, 25% of sports injuries occur in the lower parts such as ankle and foot. Further, as per statistics of the Centers for Disease Control and Prevention (CDC), more than 2.6 million children between 0 and 19 years are treated in the emergency room each year for sports and for injuries due to leisure sports. Severe bone-injuries among amateur sportsmen and sport enthusiasts for leisure have also been reported further stoking the demand for orthopedic braces and supports, casts, and splints. Growing geriatric population worldwide as well as increasing number of obese population is another key factor behind the growth of orthopedic braces, support, casting and splints market, says the lead analyst of the report. Geriatrics are more prone to bone disorders such as back pain, arthritis, and osteoporosis. Like-wise, obese people are more susceptible to orthopedic injuries; build up of excessive fat results in increased body weight thereby causing severe pressure on joints, tendons, and ligaments in the lower part of the body.